Dunc Smith is a new Grand Life Master. Photograph by Deddeda Stemler. It was another ordinary hand in an ordinary club game on an ordinary Thursday at the Victoria Bridge Centre. Soon after Duncan Smith played his 13th and final card, an observer offered a postgame assessment. The triumph provided Mr. Smith with enough points to cross a threshold established by the American Contract Bridge League. After having long ago established himself as a Life Master (300 points) and later earning such descriptive designations as bronze (500), silver (1,000), gold (2,500), diamond (5,000), and emerald (7,500), Mr. Smith had accumulated 10,000 points. Coupled with a national championship won 16 years ago, Mr. Smith attained status as a Grand Life Master. What did he feel at that moment? Mr. Smith, 61, is believed to be the first Victoria-born player to achieve the highest rank in contract bridge. Only eight living Canadians have reached the pinnacle. Such an achievement has not come without a cost. The son of a university mathematics professor, Mr. Smith grew up in a household in which discussions about the permutations of bridge hands dominated supper-table conversation. Both parents were avid players. At 15, he served as a caddy at a tournament held in the Crystal Ballroom at the Empress Hotel. It was his job to collect score slips for delivery to the scorekeeper. The task left him plenty of time to kibitz. 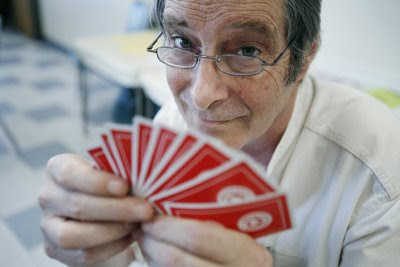 He added bridge to a school hallway repertoire of hearts, rummy, cribbage, and poker. In the fall of 1966, he enrolled as a linguistics major at the University of Victoria. He would not come close to completing a degree, winding up instead “with a major in bridge.” Classrooms offered little more than boring lectures. The Student Union Building offered never-ending card games, each different from its predecessor. His autodidactic education suffered a setback when he was diagnosed with multiple brain abscesses before his 23rd birthday. The prognosis was poor. Before undergoing surgery, his family was told he had a 10 per cent chance of living and, if so, he had a 90 per cent chance he would do so as “a vegetable.” He then underwent a series of three craniotomies, which were “as harsh as they sound.” He emerged blind in his left eye. “I was comatose throughout so it was tougher on my family than it was on me,” he said. Hospitalized on Victoria Day in 1971, he was released on Labour Day. A marriage delayed by his recovery was held in December. It produced two daughters and lasted 13 years before ending in divorce. He acknowledges a price paid for his self-described obsession. On the other hand, his relationship with playing partner Jim McAvoy, a chartered general accountant, lasted 25 years. They won a national title in Ottawa in 1993. “It gets to a point where you feel like you're playing with yourself,” Mr. Smith said of their teamwork. Ask Mr. Smith with which famous personages he has played and he offers a quartet of names unknown outside the world of bridge, among them the creator of the Jacoby Two No-Trump Response. Further prodding reveals a game played against Omar Sharif, the Egyptian-born actor, syndicated bridge columnist, and author of such pastime bibles as Omar Sharif Talks Bridge , Play Bridge With Omar Sharif and Play More Bridge With Omar Sharif . The game was played at the exclusive Bal Harbour Hotel in Miami Beach, Fla.
“There was an absolute throng of spectators,” Mr. Smith recalled. Pause. Incredibly, bridge was an official demonstration sport at the 2002 Winter Olympics in Salt Lake City, Utah. The status necessitated drug testing, an oddity for a sport in which nothing heavier is lifted than a pencil and 13 playing cards. Mr. Smith narrowly lost an opportunity to represent Canada to a team that went on to claim the gold medal. He spent several years working as an orderly in a hospital emergency ward, following a stint as an orderly at a psychiatric ward where his duties included restraining violent patients. He worked 15 years as a housekeeper before going on disability. Two other Victoria residents – Anna Boivin and Doug Fraser – are also Grand Life Masters. Both launched their careers in Montreal. The only other title holder in the province is Aidan Ballantyne of Burnaby. Mr. Smith was asked what it takes to become a world-class player. Which is pretty much what he has done. Had he enjoyed similar success at, say, poker, he might now be a wealthy man, perhaps even a television star. Instead, he plays in near anonymity, enjoying the camaraderie of the card table, knowing that he has bridge friends in nearly any city on the continent. Last month, Mr. Smith celebrated the triumph of his lifelong quest the only way he knew how. The cards were shuffled and distributed before bidding began anew. Thank you for this column. These are names I recognize from my youth in the 1970s as a caddy at bridge tournaments - for awhile when worked as a caddy it was Aidan Ballantyne that hired the youth to work at the tournaments. I learned bridge by osmosis - kibitzing at the tables of good players. I grew up in a bridge household, breakfast talk between my parents was an analysis of the hands of the night before. My parents were one of the few married couples that always played together at the tournaments, many couples could not deal with the tension. They were perfect match for each other - my father mathematical and cautious, my mother reading people and pushing the hand. I to ran into bridge at UVic in the SUB, but by the early 1980s it was rare. The bridge crowd at the tournaments has remained a generation or more older than me. 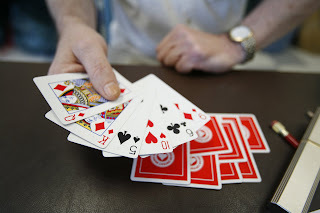 My hope has been that the craze for Texas Hold'em Poker would spur an interest in Bridge as a game. Very interesting. I hope to learn this game. The only card game I know so far is how to play bridge contract card game introduced to me by my grand parents. But I'd really like to try other games for a change and I wonder if this applies to other card games. It'll be great if ever. Keep on posting interesting stuff, more power to your blog.